Exact same Comb Knives others charge $10 or more. The element of surprise is exactly what you need to be in advantage in any encounter. Cleverly disguised as a comb, this sleek 3.5-inch knife might be the perfect solution for you when you're on the go. The narrow steel blade is concealed inside a 6.5-inch comb, and no one will know you are carrying a knife unless you tell them you are. Because it is small enough to slip into your purse or jacket pocket, you can bring it virtually anywhere undetected. Ideal for stabbing and slicing in close-quarters combat, this comb knife is versatile enough to be used as a seatbelt cutter during an emergency. Featuring keen edge and an ergonomically shaped handle, as well as an actual comb on the end, this spear-point knife is sharp on both sides. The comb end snaps into place to keep it safe while it's not in use, but it does come off with a sure tug. It's an economical and stealthy alternative to a traditional fixed blade knife. Stash a secret knife disguised as an ordinary comb in your handbag for an extra measure of protection. 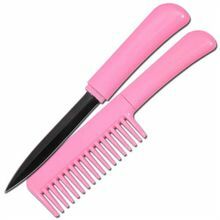 The comb knifes come in several colors, black, pink, and red. Sometimes purple or blue are available. See the dropdown menu. You must be 18 or older to purchase at DefenseDevices.com, and knife combs are not approved for carrying during air travel. Buy 5 or more and get $1 off each and free upgrade to Priority Mail Shipping(most delivered in 2 to 3 days anywhere in the USA) Please choose color before adding to cart. You may adjust quantity anytime.